At The Death House Door (2008, Directors: Steve James and Peter Gilbert): Directors Steve James and Peter Gilbert won were nominated for an Oscar for their work together on Hoop Dreams in 1995, and I wouldn’t be at all surprised if their latest collaboration isn’t recognized with at least a nomination at Oscar time next year. At the Death House Door introduces us to Reverend Carroll “Bud” Pickett, a retired Presbyterian minister in Huntsville, Texas. As he recounts, Huntsville used to be known for the rodeo, but over the past forty years or so, it’s become famous for all of its prisons. Reverend Pickett never intended to become a prison chaplain, but that’s what he ended up doing. For 15 years during the 80s and 90s, he served as the “death house” chaplain, the man with whom condemned prisoners spent their last day on earth. He would sit with them during the day, listen to whatever they wanted to say, eat their last meal with them, and, when the time came, just after midnight, accompany them the short walk into the room where they would be strapped down and lethally injected. Reverend Pickett did this 95 times, and after each execution, he came home and recorded an audio cassette with his thoughts. 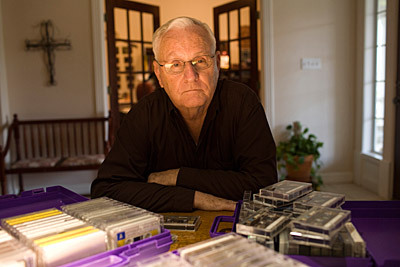 Unable to share the pain of this ministry with his family, and prevented by his hard Texas upbringing from crying freely, he poured his heart out for the tape recorder instead. Remarkably, with a few exceptions, he had never listened to these tapes again after making them. Meanwhile, Maury Possley and Steve Mills, a pair of investigative reporters from the Chicago Tribune had begun writing a series about possible cases of wrongful execution. One of the stories they uncovered was that of Carlos DeLuna, a young man from Corpus Christi, Texas, who was convicted of the 1982 stabbing death of a gas station attendant. The police found him hiding under a truck shortly after the stabbing, and although he had no blood on him at all, and claimed innocence, he was arrested, tried, and convicted. DeLuna maintained his innocence and claimed that an acquaintance, Carlos Hernandez, was responsible for the killing, although no one, even his lawyers, listened. In 1989, he was executed at the young age of 27. Reverend Pickett was with him when he died, and despite claims that lethal injection is quick and painless, he reported that DeLuna didn’t respond to the first drug, a sedative, and took 11 long minutes to die. Possley and Mills visit with Pickett and discover his archive of tapes. He tells them that of all the prisoners he knew, DeLuna was the one that he was convinced was completely innocent. Over the years, the strain of the job had nagged him, but especially the notion that he was party to the execution of an innocent man. Although he had been a strong proponent of the death penalty when he started the job, after accompanying so many men to the death chamber, his opinion had completely changed. Whether they were guilty or innocent, Pickett cherished the time spent with the men, even as it strained him to be so powerless over their fates. We spend the majority of the film with Reverend Pickett, certainly a fascinating character, but there are some other characters, including DeLuna’s sister Rose, who still lives with the guilt that she should have done more. Pickett also introduces us to a younger colleague who worked as a death house guard until the strain of working in an institutional death factory drove him to a breakdown. Texas has executed more prisoners than any other state and it’s clear that capital punishment is not deterring anyone. Not only that, it’s creating more victims as we see the families of prisoners suffer. Worse, it dehumanizes everyone involved in the process, from the prisoner himself to the prison guards and chaplains who work for the state. In one chilling scene, the camera floats around the prison as Texas executes its 400th prisoner. We watch from a distance as the man’s family are allowed access into the prison for their last visit, and then we see the guards bringing out the man’s personal effects in bags and dumping them outside the gates like so much garbage. Soon the man’s body will be taken out in much the same way. It’s heartbreaking. Even as he came to strongly disagree with capital punishment, Reverend Pickett continued his ministry to these condemned men, firstly because he “wasn’t a quitter,” but more importantly, because they needed a friend at this moment, someone who would be there right until the end, even as their families were banished. Sadly, he informs us that the Texas prison system recently changed the system. Instead of having 18 hours with the prisoner, now they’re brought into the death house at 4:00pm, showered, fed, and then executed at 6:00pm. The chaplain barely has time to say a few words. One wonders if this change is meant to inflict even more pain on the prisoner, denying them any meaningful human contact at all. At the Death House Door is deeply meditative, due in major part to the character of Reverend Pickett, a man who has been indelibly marked by his work. It has made him question his politics, his opinions, even his faith. It has estranged him at times from his wife and his children. But he made these sacrifices because he truly believes no one should die alone. Wherever you stand on the question of capital punishment, this film will make you think about the people we ask to do the unthinkable. This entry was posted in Documentaries, Film Festivals, Hot Docs and tagged #hotdocs08, capitalpunishment, christianity, deathpenalty, prison, texas. Bookmark the permalink. Damn. I skipped this film last night because I had to get some work done. Sounds like I missed a great film. Great review, but one quibble: Hoop Dreams wasn’t even nominated for an Oscar in 1995. The winner that year was the entirely forgettable Anne Frank Remembered. Thanks, Doc. You’re right. They were nominated for Best Editing, but lost to Forrest Gump! The documentary Oscar went to Maya Lin: A Strong Clear Vision. The Anne Frank film was made in 1995 but won an Oscar in 1996. That brings me to an annoying point. Are they the 1995 Oscars if they take place in 1995 but honour films made in 1994? Confusing! Oh yes. That was the year the Academy gave the documentary Oscar to the head of is documentary division. I’ll have to watch Maya Lin: A Strong Clear Vision one day and see how much of a travesty that really was. Must remember to put that on my want list.